Dynamic Ballroom is Lake Norman’s Premier Ballroom Dance Studio. The place to be for Ballroom, Latin, Swing, Salsa, Tango, Wedding Dance instruction… and much more! Offering group classes for only $10/class, dance parties, workshops, social events, showcases, outings, and new students receive their first private lesson for just $20. Owners of Dynamic Ballroom, Christine and J.R. Hipsky, met while living in New York City. Both had moved there to pursue the highest level of competitive Ballroom Dance training in International Latin and Standard. They auditioned each other and became dance partners in 2005, traveling to dance competitions all over the U.S. and England.They were married in 2008, and moved to Charlotte several years afterwards. Their dream was to open a dance studio where all are welcome and everyone leaves a better dancer, no matter their goal: be it intensive competitive DanceSport, social dancing, or maybe just a wedding dance routine for your special day! We offer all styles of ballroom dance, as well as latin and social nightclub dances, for adults and children. Our ballroom is also available for rent and features a beautiful 2,800 sq ft Moso Premium Bamboo open dance floor with plenty of mirrors, lounge area, bistro tables and folding chairs for extra seating, three Swarovski chandeliers, and spacious restrooms. 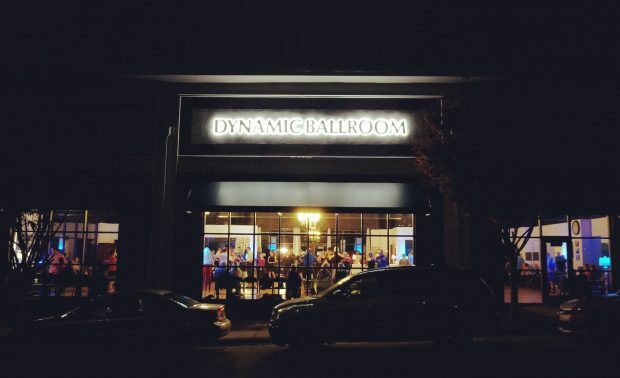 Welcome to Dynamic Ballroom! Come join the fun. BUILD: Strength, Endurance, Rhythm, Flexibility, Lasting Friendships … Dynamic Ballroom.